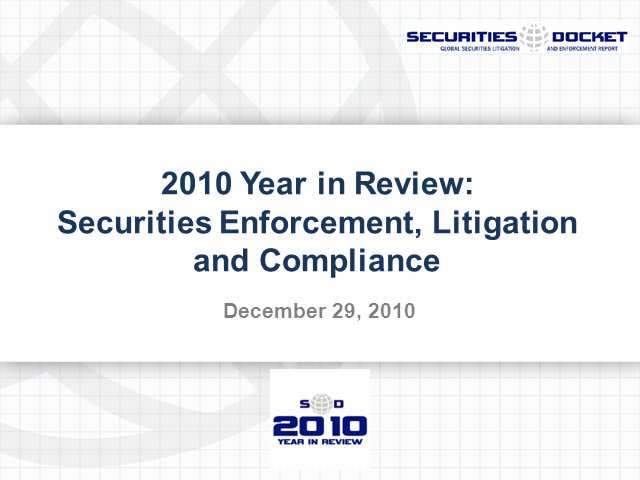 Securities Docket's annual "year in review" webcast featuring many of the leading bloggers and commentators in the field. The panel will include Matt Kelly, Francine McKenna, Mike Koehler (aka the "FCPA Professor"), Francis Pileggi, Kevin LaCroix, Tracy Coenen, Lyle Roberts and Bruce Carton. Kelly, McKenna, Koehler, Pileggi, LaCroix, Coenen, Roberts, Carton. Presented by: Kelly, McKenna, Koehler, Pileggi, LaCroix, Coenen, Roberts, Carton.